Susan Mintz’s husband, Jeffrey Mintz, died 23 years ago. But she said she kept her vows and never remarried. “I’m that kind of person. Until death do us part,” Mintz said. Through her books, she also has kept her husband’s memory and his struggle against AIDS alive. The disease took his life on Aug. 17, 1994, when he was 47. She met Jeffrey Mintz in grade school and said right away knew she loved him. “He was so incredibly handsome. He was funny, smart, had a wicked sense of humor. He was every father’s child and every mother’s son. He made me laugh. My mom always knew when I was on the phone with him,” Mintz said. Mintz will be reading from both her books and signing them from noon to 4 p.m. Nov. 1 at Barnes & Noble, 1400 Glades Road, Boca Raton. She said that love grew when he became ill.
Now she wants to help spare others the same fate as her late husband. “God has given me the strength,” she said. 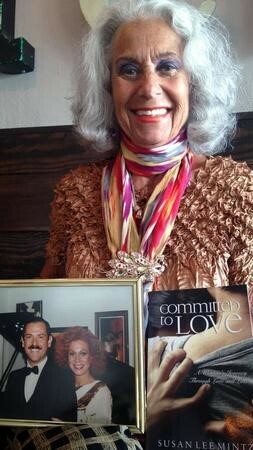 Her efforts have led her to become an AIDS lecture series speaker and give interviews, including on the Trinity Broadcasting Network and the 700 Club on the Christian Broadcasting Network. But there’s still more story to tell, she said. Susan is confident she’ll one day see her and her husband’s love story portrayed on film as an adaptation of her “Committed to Love” book. Through it all though, despite her husband’s death, she views their story as a positive one. “There’s a message of hope . . . you can get through it. Love conquers all,” she said.